A popular trip from Bangkok, Ko Samet provides a getaway with white-sand beaches, clear waters, and coral reefs teeming with fish. Both Thai and foreign travelers frequent the island to either laze on the beaches or take advantage of popular things to do in Ko Samet, which include mountain biking, boat trips, and scuba diving. Vendors sell deliciously barbecued dishes along livelier beaches, while hawkers offer goodies like fruit and ice cream. Only one main road makes navigating on the island easy, and whether you prefer to walk, use a tuktuk, or rent your own motorcycle, sightseeing in for Ko Samet presents few transportation problems. 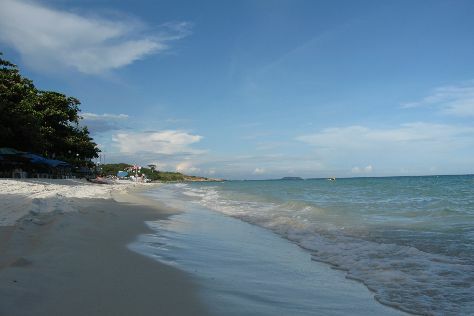 Ko Samet is in Rayong Province. Use our custom trip planner: Ko Samet and all its delights await.